We're heading towards the end of the festival, which closes on Saturday, and Ms TN is feeling, truth be told, rather ragged. On the one hand, devoting myself to a single activity rather than the several which usually occupy me is something of a holiday (although the copyedit for the US edition of Black Spring is sitting on my desk, looking reproachful and reminding me of other duties). On the other, this has been a consuming festival which has generated a lot of intense conversation, both offline over post-show drinks and kitchen tables, and online, as you will see if you look at the comments beneath An Enemy of the People and An Act of Now. This passionate engagement is the quality I most associate with a successful festival, and the 2012 Melbourne Festival has had it in spades. My Regrets of This Week are missing Young Jean Lee's We're Gonna Die and Merlyn Quaife performing Schoenberg's Pierrot Lunaire, of which I hear good things: but let's face it, you can't be everywhere. Or anywhere, sometimes. This week I dipped my toe into another strong strand of this year's festival: the presence of children. With Gob Squad and CAMPO's Before Your Very Eyes, seven young people created theatre for adults. In Arena Theatre's The House of Dreaming (as well as Polyglot's How High The Sky, which I didn't see) theatre was made by adults for children. That taking theatre for children seriously is crucial to the artform ought to go without saying; but it's been a point often lost in our mainstream programming, which has lagged seriously behind Europe in its focus on young people. This, as Age critic Cameron Woodhead observes, is now changing. Back in 2008, when CAMPO were called Victoria, they brought a beautiful show to Melbourne, That Night Follows Day. 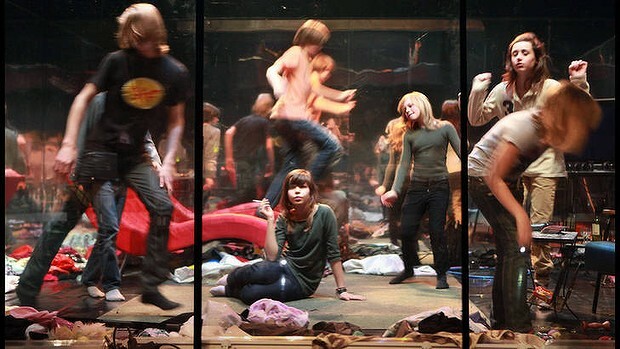 Directed by Forced Entertainment's Tim Etchells, this was the second part of a trilogy in which Victoria/CAMPO collaborated with different artists to create shows in which children performed for adults. Before Your Very Eyes is the third part, a collaboration this time with the German/English collective Gob Squad. Developed over three years, Before Your Very Eyes takes advantage of how rapidly children change as they get older: there's a radical developmental difference, for example, between seven and 10, or 14 and 17. The long development permitted the company to enact encounters between older and younger selves, which betrays the meticulous level of planning that underlies this show. The feeling of control is made explicit by the set-up: we watch the children as they perform behind glass, in an enclosed room, with a disembodied Big Brother voice issuing instructions on what they should do next. The window through which we peer is pretty much a cliche of contemporary theatre by now, but it's revitalised by the particular sense of voyeurism that attends staring at these children, that's intensified as we realise that the windows are one-way mirrors: while we can see them, they can't see us. Moreover, backstage is also mirrored, reflecting the audience, so that we are, in some moments, unsettlingly represented on stage in the same visual space as the performers. The entire show is premised, quite shamelessly, on cliches. At the beginning we are told, via the surtitles above the set, what the deal is: "Ladies and Gentlemen! Gob Squad proudly present a live show with real children. A rare and magnificent opportunity to witness seven lives lived in fast forward… Before Your Very Eyes!" And that is pretty much what happens. We see the children now, as they play, dance, pose, fight: then they speak to their younger selves (recorded on video, in impeccably timed dialogues between filmed and live performance). We see them smearing on goth make-up and smoking cigarettes, to become the cliched rebellious adolescents; then they dress up as middle-aged men and women at an unsuccessful birthday party, in which the gaps between childish aspirations and adult disappointments yawn widely; then they put on wigs and old people makeup and die. The End. The seven performers are all astoundingly good. What is perhaps most astounding is the spontaneity that their performances generate, in a show which is so overtly dictated: the considerable poignancy of this work exists in the tension between this spontaneity and our constant awareness of the show's artifice. Aging is a complex phenomenon, after all, but it is also brutally clear: you get older, and then you die. It's directed with constantly inventive detail, but this show's stark refusal to be more than it pretends to be is a huge part of its success. The children are performing themselves, in a very peculiar, borderline sinister way, and the schematic arc they enact for us - from the seven year old telling us "I can eat" to the final lipsyncing of Piaf's Non, Je Ne Regrette Rien in old-person wigs - somehow cracks open a space in which our own mortality resonates. 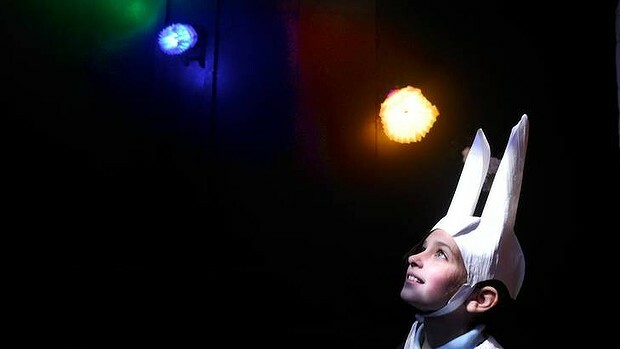 The night before, I went to see Arena Theatre's The House of Dreaming, an immersive theatre work created purportedly for five to eight year olds. Arena actually says "for children aged five and over", which is sufficiently open to admit adults too. This is, production-wise, an intensely complex work, incorporating performance, interactive lighting, video and set design, oribotic electronics, music and narrative into a single experience, as you move through the different rooms of an imaginary house. The first thing you do is to dress up: the audience enters the house in groups of three, each adorned in paper capes and hats to become a witch/wizard, queen/king or a rabbit. After I had gone through the house myself, I was amused to see the adult audience members for that session lining up with the children for their costumes: everyone looked ridiculously pleased. I guess it's not often that we get permission to behave like kids. Well, I do, but the fine writing at the bottom of my Writer's Contract includes a clause that says it's perfectly okay to be a child sometimes. One the way to the anteroom, you are invited to peer through tiny portholes into a large artificial bush in the foyer: inside are some exquisite miniature rooms. Then you take off your shoes and are given some very desirable objects, white talismans like chess pieces that fit comfortingly into the palm of your hand, and you enter the Lawler Studio, which is filled by a huge weatherboard house. There are three screen doors, which open into a porch-like room with three dressing tables. You put your talisman, which is actually a kind of electronic switch, on a lighted pad, and the dressing table mirror comes alive: instead of seeing your own reflection, you see a queen, or a rabbit, or a witch, who welcomes you into this world. Then you ring a bell on a door and are admitted into the house proper. The journey begins and ends in a bedroom with a fourposter bed, the site of sleep: from there you walk, or crawl, through unexpected exits (under tables, through bed heads) through a series of rooms that are at once familiar and strange. The second room took me right back to my own childhood: it was so like my grandmother's attic, the huge room atop the family house in Cornwall, which bewitched us with old games and trunks of costumes, antique mirrors, wooden cabinets with miniature drawers that opened to reveal collections of butterflies and beetles under glass. Each room is a surprise: voices instruct you or tell you rhymes, doors light up and invite you to move further in, old bakelite telephones ring and speak to you, performers show you strange objects or tell you more of the story. The narrative, which I never quite grasped, was about absence: it concerned a mysterious Tibetan flower that the house dreamed into being when its owners, one of whom was a botanist, disappeared forever. We found ourselves consumed by curiosity: we inspected everything, the objects on tables, jars, the insides of cupboards. I was very happy to be there for half an hour, and felt a real lurch of disappointment when we came to the end: I would have been content to explore this world for much longer. Also, we had to give back the talismans and the costumes: I can imagine that it might be a little difficult on occasion to convince small children that they have to be returned. I think it could bear some refining: I wasn't the only one for whom the connecting narrative was dispersed and unclear, although for me that actually didn't matter very much. Occasionally it wasn't clear what we should do next: in immersive theatre of this kind, and especially for young children, the clarity of instruction is absolutely crucial. But despite one or two small glitches, it was an enchanting experience; the children we spoke to afterwards loved it. The House of Dreaming is a beautiful and original work, and wholly unpatronising. I wish theatre like that had been around when I was six. Before Your Very Eyes, concept design and direction by God Squad. Gob Squad and CAMPO. Melbourne Festival, Merlyn Theatre, Malthouse, until October 27. The House of Dreaming, directed by Chris Kohn. Arena Theatre at the Lawler Studio, MTC Theatre, until October 27.